I thought I might share a few photos and some information on an interesting wildflower that I photographed in the Great Smoky Mountain National Park a few weeks back. I photographed this little beauty in a wet ditch along Clingman’s Dome Road in the park. The Purple Fringed Orchid is a really cool wild orchid that grows in many places in the Eastern U.S. but is not always easily found. And since I am so lazy tonight, According to the Lady Bird Johnson Wildflower Center….. Deeply fringed, fragrant, lavender flowers in many-flowered, elongated clusters on a leafy stem. 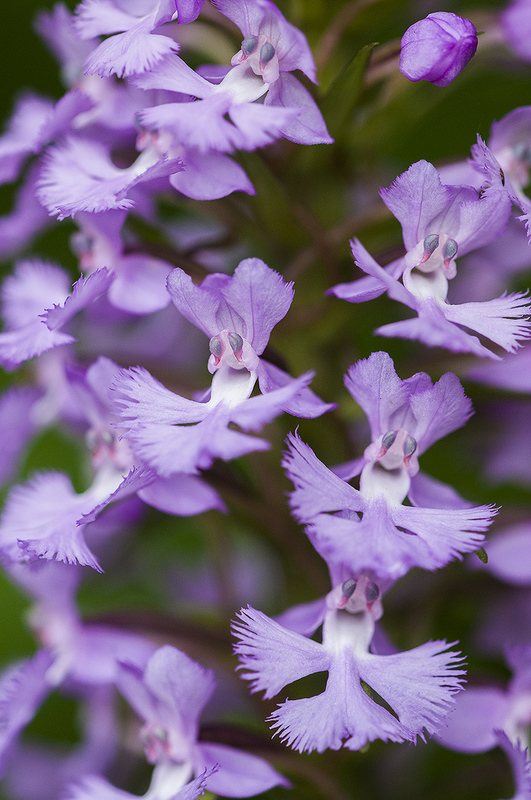 A close-up of the individual flowers reveals the striking beauty of the fringed orchids. The method of pollination by moths is interesting. The pollen masses (pollinia) bear a sticky disk that protrudes below the anther. As the moth extends its tongue into the spur of the lip petal and then out again, it pulls the pollen mass from the anther and carries it to another flower where cross-pollination occurs. 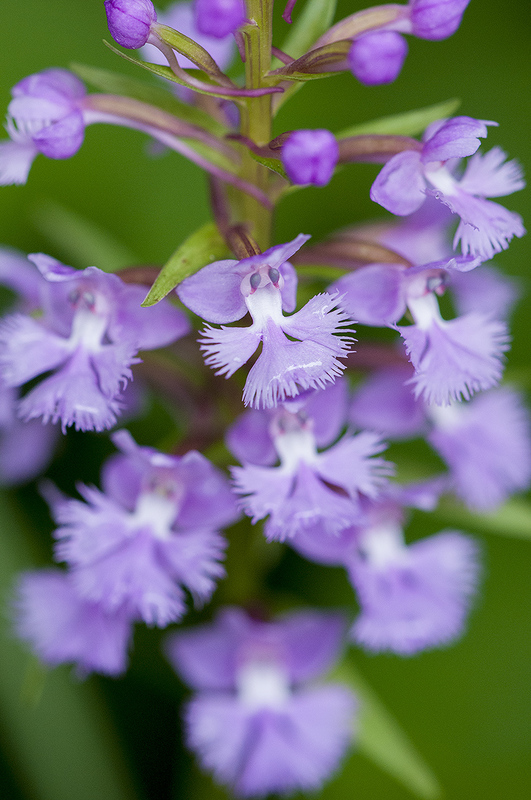 Small Purple Fringed Orchid (P. psycodes), occurring from Manitoba east to Newfoundland, south to Georgia, and northwest to Tennessee, Missouri, and Minnesota, has smaller flowers. Purple Fringeless Orchid (P. peramoena) has an unfringed lip petal; it grows from Pennsylvania and New Jersey south to Georgia, west to Arkansas, and north to Missouri and Illinois. But what I also find so curious about this little wildflower is the resemblance of a hummingbird feeding on a bloom that is so cool !! 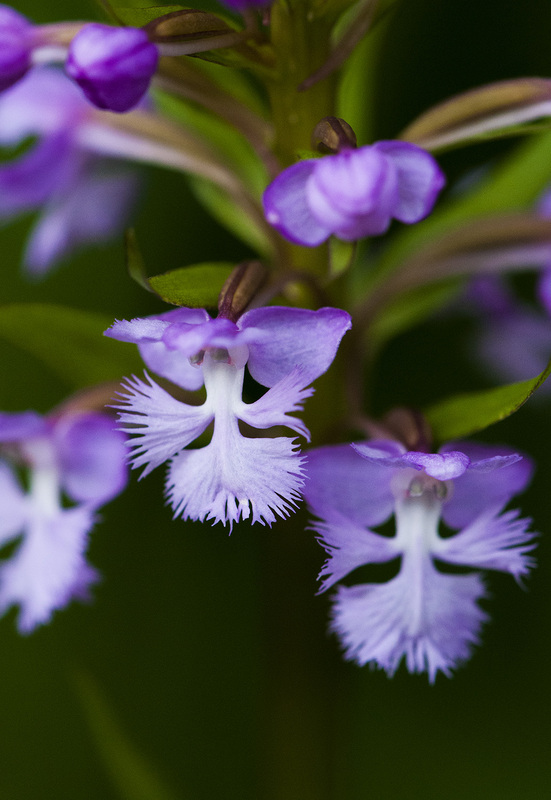 Posted on August 6, 2013 by Bernie KasperPosted in art, Blue Ridge Mountains, flower photography, Great Smoky Mountain National Park, macro photography, madison indiana photography, nature, nature photography, photography, thoughts, travel, West Street Art Center, wildflowersTagged Arkansas, Georgia, Lady Bird Johnson Wildflower Center, Manitoba, Missouri, New Jersey, Orchidaceae, Pollination. What a gorgeous little orchid! I’ve never before seen this one but I love it! It must be very exciting to find one. Great photos! Thanks Terry they are pretty cool !! I found the “Lesser” variety in Northern Maine two years ago and really like this flower very much. The individual blooms look like little whiskered faces…to anthropomorphic me… You have shown them off quite nicely, Bernie. Thanks Steve..they definitely have a very unique look about them !! You know I have never seen that hummingbird before now – and now it seems quite obvious! Thanks Mark, they are a really cool Orchid !! These delicate orchids look like they could fly away. In the second image, they look like little, funny faces. I especially like the first photo, with the excellent selective focus. What lens are you using for your wildflower photos?